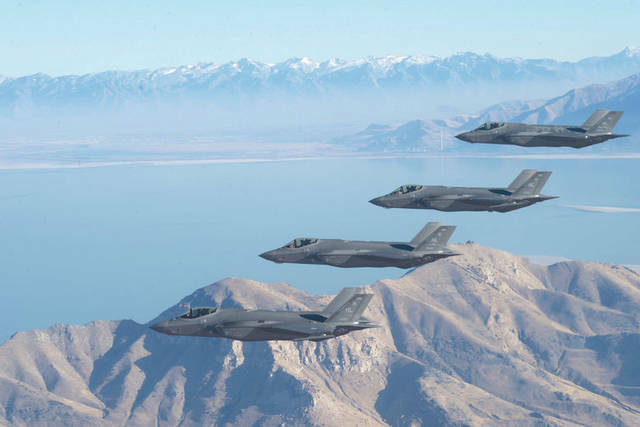 Submitted photo A formation of F-35 Lightning IIs from the 388th Fighter Wing and 419th FW stationed at Hill Air Force Base, Utah, perform aerial maneuvers during as part of a combat power exercise over Utah Test and Training Range. WRIGHT-PATTERSON AIR FORCE BASE — The Air Force has selected Wright-Patterson Air Force Base as the preferred location for the F-35 Lightning II Hybrid Product Support Integrator organization which supports the entire F-35 enterprise to include joint and international partners. Air Force officials said Robins Air Force Base, Ga., was named as a reasonable alternative. The current F-35 HPSI organization was established in 2016 in Crystal City, Va., at the F-35 Joint Program Office. HPSI supports a global fleet of more than 340 aircraft and when it moves to its new location will be led by the Air Force with a workforce from the Air Force, Navy, Marine Corps, international partners and industry. The organization will be directly accountable to the product support manager within the F-35 Joint Program Office. This organization is an integral part of maintaining and prolonging operations of the global F-35 fleet. The new mission will bring at least 400 jobs, with the potential for more to be located at the base over the next several years. In April, Congressman Mike Turner and Senators Sherrod Brown and Rob Portman led the entire Ohio congressional delegation in advocating to Wilson for the mission to come to Wright-Patterson because the base is uniquely qualified to handle the new mission. In a meeting Turner arranged in June, the senators and other members of the Ohio delegation met with Wilson in Washington and made the case for Wright-Patterson in person. https://www.fairborndailyherald.com/wp-content/uploads/sites/50/2018/12/web1_181119-F-WJ663-9926.jpgSubmitted photo A formation of F-35 Lightning IIs from the 388th Fighter Wing and 419th FW stationed at Hill Air Force Base, Utah, perform aerial maneuvers during as part of a combat power exercise over Utah Test and Training Range.